Thanksgiving Day in America is a time to offer thanks, of family gatherings, and holiday meals. But the best part about Thanksgiving is the memories: the festive table with all the delicious food, the backyard football games, and the laughter of loved ones catching up. 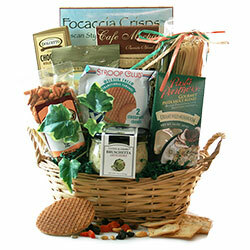 Add something special to the celebration with an delightful gift basket of foodie treats! 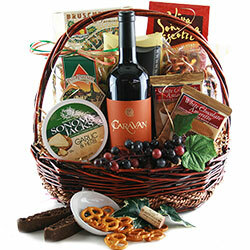 Our Thanksgiving gift baskets are overflowing with savory gourmet foods and delectable sweets guaranteed to please any palate. 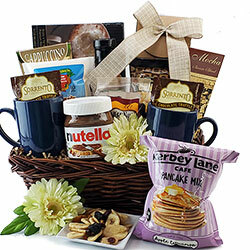 You can choose from a variety of themes, and if you want to create a Thanksgiving basket tailored just to your liking, you can personalize your gift with add-on products like picture frames, coffee mugs, imprinted ribbon, and more. Let the feasting begin! Sometimes you can’t make the pilgrimage to be with some of your loved ones on Thanksgiving. Or maybe you’re attending a huge feast and need to bring a present for the host. A gift basket just might be the perfect offering for any Thanksgiving occasion -- there are some resemblances to a cornucopia after all! Our standard Thanksgiving baskets run the gamut and are all designed around what Thanksgiving is all about: food, drinks, and more food. If nothing makes your stomach grumble after looking through the selection, you can always design your own one-of-a-kind Turkey Day gift basket. 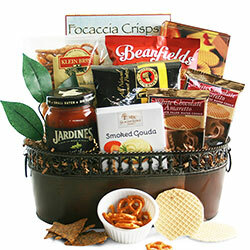 It’s easy and you can have a completely personalized gift basket in a few minutes. 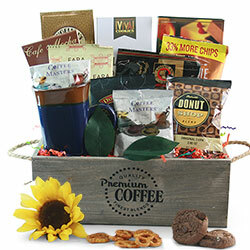 This November, you can choose from a several different Thanksgiving gift basket options. Here are some ideas for you, based on the different types of people you may be wanting to treat! 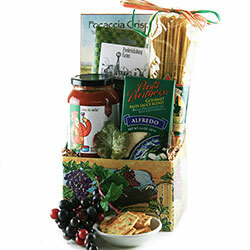 Family: If you’re looking for something for an entire family, try the Pasta Grande Italian Gift Basket or Italian Flare Italian Gift Basket. 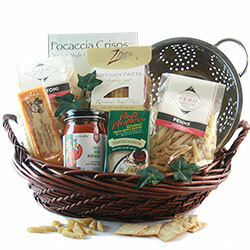 The flavors of Italy will warm any house! Tasty pasta is a family favorite and can easily feed a big group, while the red pepper bruschetta makes for the perfect aperitivo. Gooble Gobble! Friends: Whether you’re attending a Friendsgiving or looking for a Thanksgiving gift basket that your friends might appreciate, there are a couple baskets that we’d recommend. 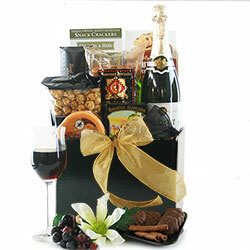 The Here’s To You Food Gift Basket is a popular choice with it’s refined array of gourmet items. The Tuscan crisps, brie cheese, bruschetta, and cappuccino mix are tasteful delicacies that your closest pals will appreciate. 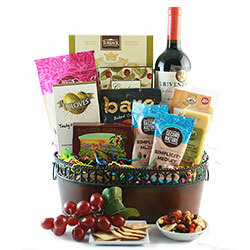 Or you can choose a similar basket for the friend who prefers drinking to eating: A Toast To You Wine Gift Basket. 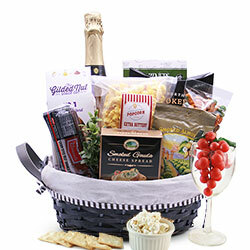 Including, of course, a savory bottle of wine, the gift basket also presents perfect pairings with its gourmet cheese, Belgian biscuits, and dried fruit. Coworkers: Last but not least are a couple Thanksgiving gift ideas for your coworkers. 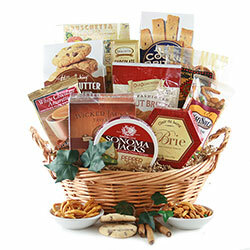 The Warm Wishes Gourmet Gift Basket conveys the perfect level of thoughtfulness and holiday cheer with three different types of delicious cookies, biscotti, popcorn, and a variety of coffee selections. 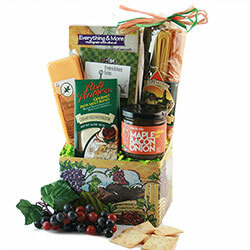 The Autumn Splendor Fall Gift Basket is less Thanksgiving focused, but still in the spirit of the season. It includes a fuzzy fleece blanket, tomato and cheese soup, apple chips, cheddar cheese, and more. Lastly, what better way to show your thankfulness than with the Thanks a Billion! 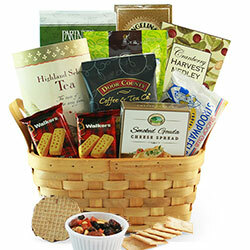 Thank You Gift Basket. 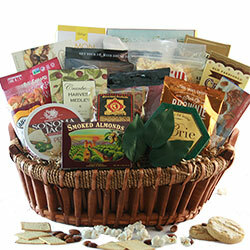 Full of delicious snacks like tortillas chips, guacamole, smoked salmon, truffle cookies, and more, there’s plenty to appreciate and be thankful for in this basket. Whether you’re giving these baskets to specific people or simply bringing them to Thanksgiving dinner for all to share, each item is sure to be enjoyed.